The weatherproof AirLancer ON-T60ag sector antenna is ideal for WLAN coverage over larger areas, including warehouses and factories. With a beam angle of approx. 60° it is also suitable for connections to several surrounding buildings (point-to-multipoint). With 3x3 MIMO support, it ensures maximum performance for reliable WLAN client connectivity in difficult environments, especially where reflections and scattering occur. It is ideal in combination with dual-radio access points to offer parallel operation at 5 GHz with 2x2 MIMO and 2.4 GHz with 1x1 MIMO. Which antenna fits to which access point? 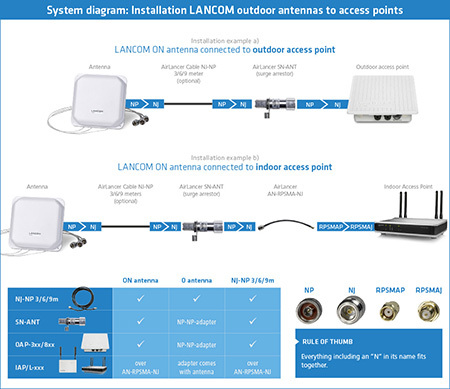 This system diagram shows the various connection option of our new antenna and accessory portfolio with LANCOM access points. 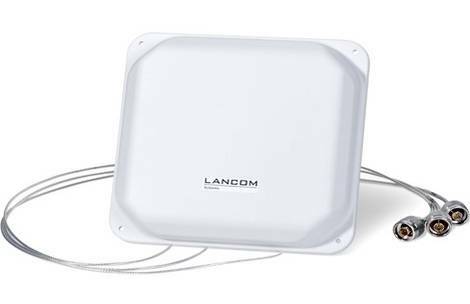 What´s special: The different LANCOM outdoor antennas can also be connected to LANCOM indoor access points with the adapter AirLancer AN-RPSMA-NJ.